We are a local company with a well-known and trusted reputation providing plumbing and sprinkler services in our Bedford, Hurst, Euless and surrounding cities for 35 Years! 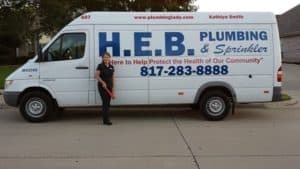 HEB Plumbing and Sprinkler-Kathyln Smith is a company specializing in all aspects of plumbing repair and sewer & drain cleaning for residential and commercial properties. If you need plumbing repairs or sewer and drain cleaning, call The Plumbing Lady. Is your sprinkler system working properly? If not, call The Sprinkler Lady. At HEB Plumbing and Sprinkler, we provide lawn sprinkler system repair and maintenance. Give us a call today to schedule an appointment. 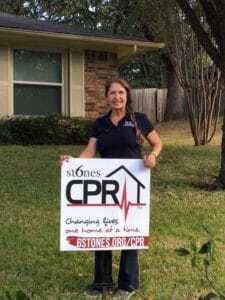 We are proud and honored to be a part of the 6 Stones Team. 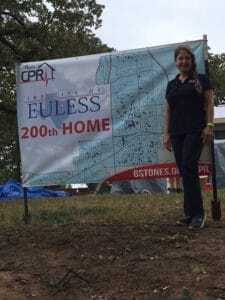 Community Powered Revitalization (CPR) is a joint effort between 6 Stones, Hurst, Euless, Bedford, various businesses, nonprofit organizations and churches to help struggling homeowners make necessary home repairs. 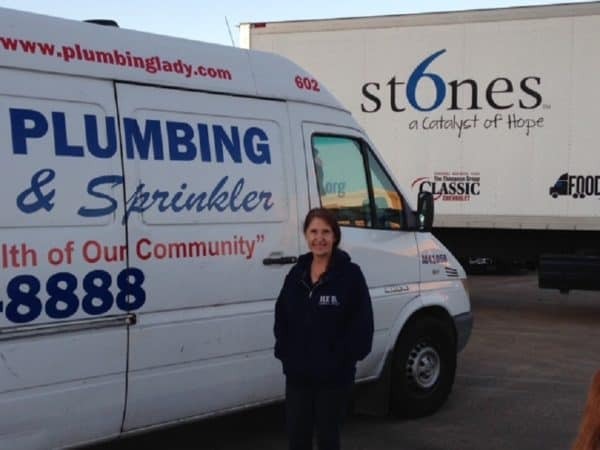 HEB Plumbing and Sprinkler joins our community in 6 Stones’s aim to strengthen, grow and revitalize our community – One House and One Family at a Time. HEB Plumbing and Sprinkler has been an A+ rated company with The Tarrant County Better Business Bureau since 1991. We hold ourselves to an incredibly high standard, and it's nice to see others appreciate it! 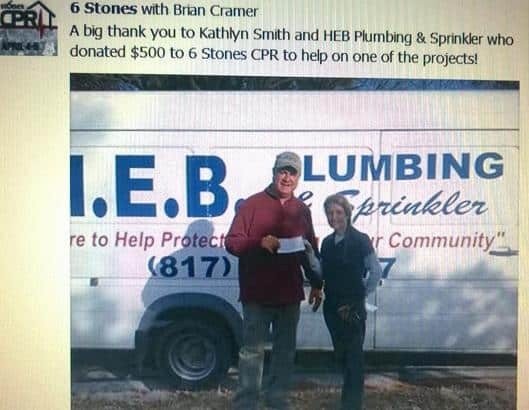 HEB Plumbing and Sprinkler-Kathlyn Smith. We appreciate the Opportunity to Have Your Business!